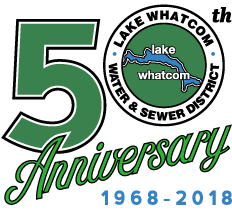 The Lake Whatcom Water and Sewer District is operated by a staff of 18 professionals dedicated to providing efficient and effective services to District customers. For a comprehensive list of staff positions, as well as current job openings with the District, please click here. Justin Clary, appointed by the Board of Commissioners in October 2018, acts as the chief executive officer responsible for managing all District departments, directing day-to-day operations, annual budget preparation, ensuring implementation of the District’s capital improvement programs, and serving as the Board’s chief policy adviser. A licensed professional civil engineer, Mr. Clary has over fifteen years of experience working in the consulting industry, as well as eight years of experience in municipal government service in the roles of public works director and city manager. Mr. Clary’s experience in both the public and private sectors have enabled the formation of productive public/private partnerships, as well as successful completion of large-scale infrastructure projects and planning documents through securing over $50 million in state and federal grants and low interest loans. Bill Hunter has served as Assistant General Manager/District Engineer since 2005. In this role, Mr. Hunter is responsible for managing the Engineering Department, long-range planning through periodic development of the District’s comprehensive water and sewer plans, implementation of the District’s water and sewer capital improvement programs, upkeep of the District’s engineering and construction standards, and reviewing and approving private development within the District. A licensed professional civil engineer, prior to joining the District Mr. Hunter worked as a consultant engineer for 13 years designing and/or overseeing construction of various municipal water systems and treatment plants, wastewater collection systems and treatment plants, and commercial and residential developments. Since 2008, Debi Denton has served as the Finance Manager/Treasurer, responsible for managing the finances of the District and carrying out fiscal policies set by the Board of Commissioners. As manager of the Finance Department, Ms. Denton oversees all data processing, accounting, budget development, and customer service. Ms. Denton has a Bachelor of Science in Accounting from Central Washington University and has over 25 years of experience in the governmental accounting field at various levels of management accountability. Brent Winters joined the District in November 2018 to lead the Operations & Maintenance Department, which is responsible for ensuring that the District provides quality and uninterrupted water and sewer service to our customers. The O&M Department is charged with the operation and maintenance of 55 miles of water transmission and distribution lines, 71 miles of sanitary sewer collection and conveyance lines, eight reservoirs, ten water pump stations, 28 sewer lift station sites, and two water treatment plants. Prior to joining the District, Brent spent 20 years serving other utility districts in Washington State in varying roles from laborer though operations manager. With a degree in forestry, Brent also has a number of Washington State-issued water and wastewater certifications.